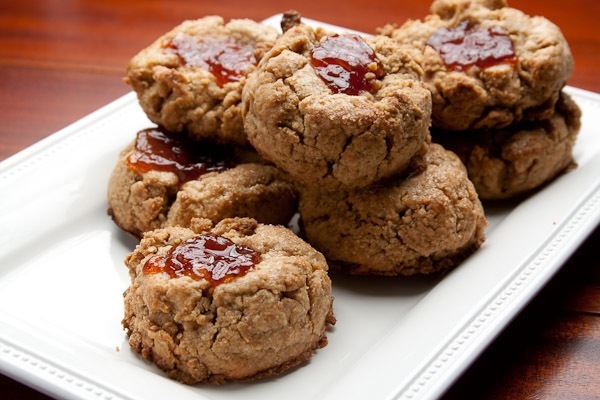 Adults and kids alike will like these scones…a bite of both the peanut butter and the jelly is just like taking a bite of a delicious PB&J sandwich! The nice people at Safeway and Foodbuzz offered to buy us ingredients if we tried out one of the recipes on their holiday recipe list. When we saw this on the list we had to give it a try. It may be under the “kid-friendly” section, but we are kids at heart so we thought it would be OK. It was pretty easy to make; you just use a food process to mix some ingredients together, mix in some cream and shape the cookies. There is no yeast involved, which means no waiting for it to rise…perfect for the impatient. It was a little tricky shaping the cookies because the dough is crumbly. Don’t worry about getting it perfectly smooth though, it will come together as it bakes. The Safeway near us just got remodeled…and it is a whole lot nicer. My favorite new feature is the automated check-out lines. I am usually able to get in and out quicker than ever. I am still getting used to the new layout of the aisles, but other than that I have no complaints. 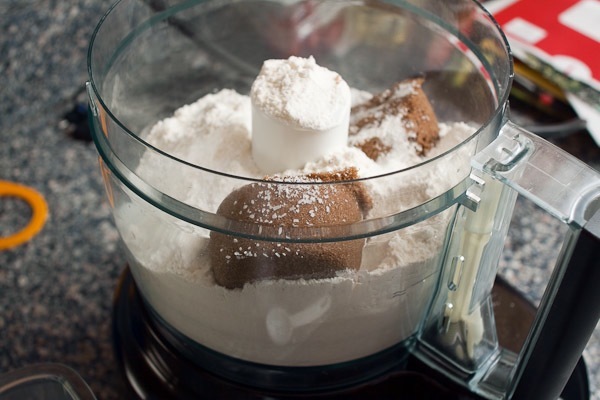 Combine flour, brown sugar, baking powder and salt in a food processor. Pulse briefly until combined. Add butter, and pulse to make a coarse meal. Add peanut butter, and pulse briefly to disperse evenly. Be careful not to over mix. Transfer dough to a large bowl. Add chocolate morsels, if desired. Make a well in center, and add 1/2 cup plus 1 tablespoon whipping cream and vanilla. Stir with a fork just until dry ingredients are moistened. Knead dough in bowl 2 or 3 times to incorporate dry ingredients in bottom of bowl. Drop mounds of dough using a 1/3-cup measure onto a baking sheet lined with parchment paper. Smooth tops, and brush scones with remaining cream. Sprinkle with turbinado sugar. 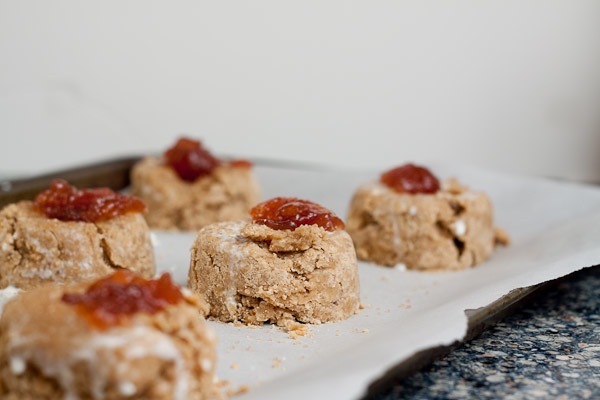 Make a deep indentation in center of each scone using thumb or the back of a small spoon; fill each with a scant tablespoon jelly. 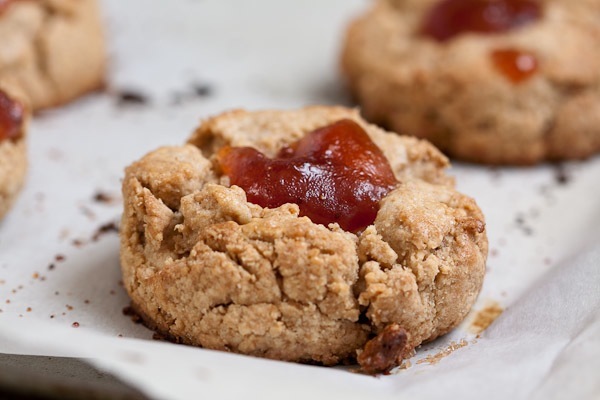 Bake for 18 to 20 minutes or until scones are lightly browned around edges. Cool completely. Not sure what I did wrong but I had to add a LOT more whipping cream than the recipe called for in order to get the dough to stick. Other than that, they ‘re delicious. Well, brought them to work and they’re going like hot cakes. People are asking for the recipe. Score! MY GOD THEY ARE SO MDELICIOUS , IM CRASY IN LOVE WITH PEANUT BUTTER LET ALONE JELLY THEY ARE MOUTH TAKING,HHM MMM MMM.